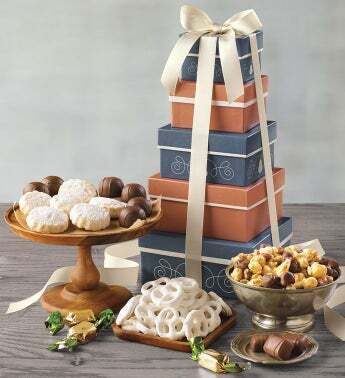 Any occasion is sweeter with a tower of gourmet treats. We fill each beautifully decorated box with delights such as irresistible Moose Munch® Gourmet Popcorn and velvety milk-chocolate truffles from our candy kitchen. From our bakery comes buttery lemon citrus shortbread cookies. We top it all off with a hand-tied ribbon.